Pearl, a black Labrador Retriever was a shelter dog that became a search and rescue dog for the Search Dog Foundation. Pearl and her handler have assisted in search and rescue searches in Haiti and Japan. To read more about Pearl, read my article, ASPCA Dog of the Year: Pearl the shelter dog turned search and rescue dog. This collage was created by using old ink figure drawings from my college days in the 1970s, which became the background rubble and pastels for Pearl herself. 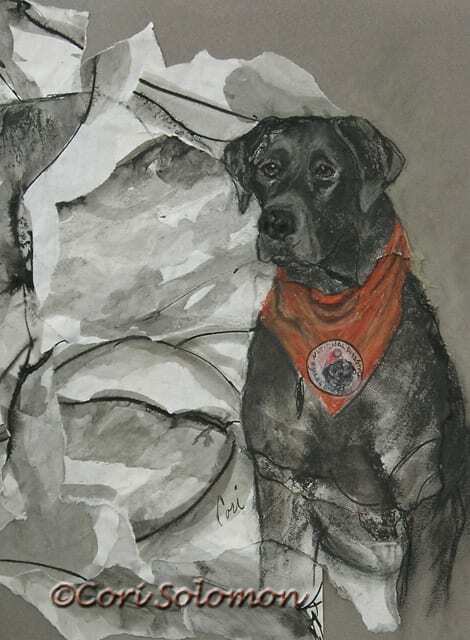 A percentage of the proceeds from the sale of this drawing will benefit the Search Dog Foundation. This pastel collage is framed and matted. To inquire about viewing the framed image or to purchase this collage email Cori.